Here’s what the deal would mean for business, markets and the economy. Companies in Britain and the European Union have spent months preparing for a chaotic Brexit. Their biggest fear is a scenario where the United Kingdom crashes out of the European Union, leading to new trade barriers. That risk hasn’t been completely eliminated and companies remain cautious. Still, business groups including the British Retail Consortium welcomed news of a potential deal. “It is vital that we avoid the cliff edge of no deal in March 2019 as this could immediately lead to consumers facing higher prices and reduced availability of many everyday products,” said Helen Dickinson, the industry group’s chief executive. Key manufacturing firms also cheered the emergence of a deal. “My gut feeling is we need to get behind it and we need to make this deal work. What we need is certainty,” Juergen Maier, UK CEO of German engineering giant Siemens (SIEGY), told BBC Radio. One more problem: The deal only covers the divorce terms, and doesn’t give businesses much clarity about a future trading relationship between the United Kingdom and its biggest trading partner following the transition. The joint declaration said that negotiations had been “particularly challenging” on how future trade in goods would be conducted. The pound has been volatile since Brits voted to leave the European Union in June 2016, and it’s still trading almost 14% lower than on the day of the referendum. Analysts said it would strengthen following a deal. 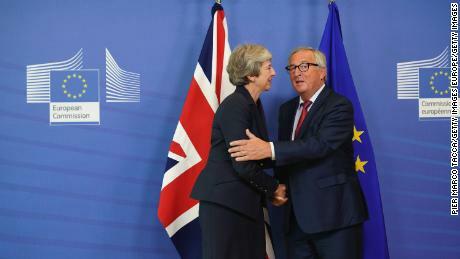 “If the deal as described in the press were to pass into law, both [the pound] and [the euro] would benefit,” Kit Juckes, a strategist at Societe Generale, wrote in a note to clients. Kallum Pickering, a senior economist at Berenberg bank, said the pound would likely jump higher in two stages, along with government bond yields and shares in companies that do business in Britain. He expects the first increase once the UK parliament has approved the divorce deal, which could happen in December, and the second during the following year as investors update their outlook for the United Kingdom. 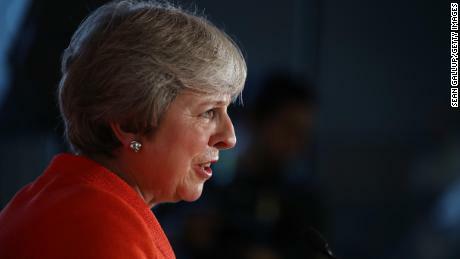 Karen Ward, a market strategist at JPMorgan Asset Management, said that investors were still “most nervous” about the deal getting through parliament. But she expects it to be approved. “Going into next year we expect business investment to experience a relief rally and higher sterling to depress inflation and lift real wages so consumer spending would also accelerate,” she wrote in a research note. The pound was trading little changed around $1.30 on Thursday. If the deal fails and Britain crashes out of the bloc, S&P estimates the pound will slump 15% against the dollar. Economists say a Brexit deal would boost the beleaguered UK economy. “While the long-term risks to UK potential growth from Brexit loom large, the prospect of a deal presents considerable upside potential for the UK economy over the medium-term,” Pickering said. Berenberg estimates that a deal would lift economic growth to 2% in 2019, from 1.3% this year. The UK economy slowed sharply following the Brexit vote, but it has avoided slumping into recession. Investment also slumped dramatically. A chaotic Brexit, without a deal, could sink the economy into a prolonged recession, S&P warned last month.